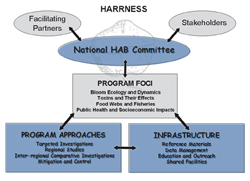 The mission of the National HAB Committee (NHC) is to facilitate coordination and communication of activities for the U.S. HAB community at a national level. The National Harmful Algal Bloom Committee (NHC) has been established for the purpose of providing a collective voice of the academic, management and stakeholder communities interested in national HAB issues. The need for such a committee was identified in HARRNESS (Harmful Algal Research and Response: A National Environmental Science Strategy (2005)) - the new U.S. National Program for HABs. Copyright ©2015 Woods Hole Oceanographic Institution, All Rights Reserved. Woods Hole Oceanographic Institution, 266 Woods Hole Road, Woods Hole, MA 02543, USA.